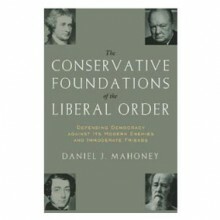 Western democracy has become increasingly estranged from its crucial historical, political, spiritual, and cultural prerequisites—from what author Daniel J. Mahoney calls “the conservative foundations of the liberal order.” In this eloquent and insightful work of political philosophy and cultural criticism, Mahoney offers a vigorous defense of these foundations, and shows the dangers of identifying liberty with a radical project of social and cultural emancipation. The Conservative Foundations of the Liberal Order takes particular aim at partisans of “pure democracy,” who have transformed the principles of liberty and equality into an unreflective dogma. By reducing liberty to a vague affirmation of equality and individual autonomy, Mahoney shows, such partisans undermine those “contents of life”—religion, patriotism, philosophical reflection, family and social life—that enrich human existence and give purpose to human freedom. What we need instead is a conservative-minded liberalism. Calling on the wisdom of Winston Churchill, Edmund Burke, Alexis de Tocqueville, Aleksandr Solzhenitsyn, Raymond Aron, and other exemplary leaders and thinkers, Mahoney addresses a wide range of questions related to liberty in the contemporary world. He brilliantly analyzes the task of the democratic statesman; the need for prudence, sobriety, and civic courage in confronting the totalitarian enemies of the West; the ties that bind religion and democratic liberty; democracy’s tendency to squander its own inheritance in frenzied efforts to establish a human order that is more and more “democratic”; the follies of the postmodern “culture of repudiation”; the reasons so many intellectuals indulge totalitarianism and terrorism; and much more. Rejecting the dual temptations of utopianism and despair, Mahoney defends self-government—properly understood—against both democracy’s enemies and its all-too-numerous “immoderate friends.” The Conservative Foundations of the Liberal Order upholds the rich civilized inheritance that allows human beings to lead free and decent lives together. Mahoney knows more about these great Europeans than anyone else…his thoughtful and endlessly detailed appreciation for what they accomplished is unrivaled…Cherish this book as the most informed defense of a chastened liberalism written in a long time. Mahoney is among our most insightful political thinkers…He brings intellectual rigor and clarity to our often simplistic conversation about liberal democracy.